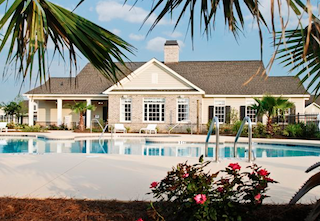 The Fairways at Savannah Quarters offers Southern charm and country club living to Georgia retirees. As part of the Savannah Quarters Country Club, The Fairways at Savannah Quarters is a charming, open-age enclave which appeals to active adult homebuyers. This lovely community of just 83 homes offers amenities through its own clubhouse, as well as access to the country club facilities. Its location in Pooler, Georgia, puts in within 10 minutes of the Savannah International Airport and just 25 miles from the nearest beach. Frank Curran, CEO and resident of the community, raves about The Fairways at Savannah Quarters' prime location in the growing Pooler area. "The suburb we are in is exploding with new growth and this city has become the fastest growing community in the State of Georgia." Frank tells us that The Outlet Mall of Georgia, a $200 million development, has been approved by the City of Pooler and is expected to open in 2015. The city's new 23-acre Village of Pooler retail center includes stores such as T.J. Maxx, Pier 1 Imports, Michael's Crafts, Petsmart and Dress for Less. Logan's Roadhouse has already opened at the Village of Pooler and restaurants to follow include Olive Garden and McDonald's. Within The Fairways at Savannah Quarters, the 3,000 square-foot clubhouse is an inviting facility which encourages residents to socialize in the fireside lounge, gather for cards or board games, and make use of the fully equipped kitchen. There is also a fitness center where residents can workout while watching TV, and an outdoor swimming pool complex with a spacious lanai. The Fairways clubhouse features on outdoor pool, fitness center, restaurant, tennis courts and more. In addition to on-site amenities, residents of The Fairways at Savannah Quarters have full access to the Savannah Quarters Country Club. This includes a dining room and fitness center, as well as the 18-hole golf course designed by Greg Norman. Epcon Communities began building homes within the community in 2008. Development is still underway with plans for a total of 83 residences, including both attached villa townhomes and detached courtyard villas. Townhome residences, sized at 1,700 or 1,850 square feet, are complete and now available only on a resale basis. Courtyard Villas, which range from 1,516 to 2,716 square feet, are still available as both resale or new construction homes. Homebuyers who are interested in The Fairways at Savannah Quarters will want to move quickly. As Frank tells us, "Our community is having its best year ever. The market has found that for our price point, we are arguably one of the finest active adult communities in Savannah."